This likely won't appeal to many of you, but Sam and I are meeting at the corner of West Basin Drive and Ohio Drive (on Hains Point) tomorrow at 9:00am for a longer-ish run. We'll run the first few miles of the Army Ten Miler course, but then we're looping back to HP to run 3 miles hard (15:00). We'll cool down after that. Tomorrow, for the first time this season, the GRC Race Team will hit the grass and mud, instead of the asphalt, at the Glory Days Grill Cross Country Invitational in Centreville, Virginia. The low-key cross country race will help prepare the team for the USATF National Club Cross County Championships on December 8 in Lexington, Kentucky. 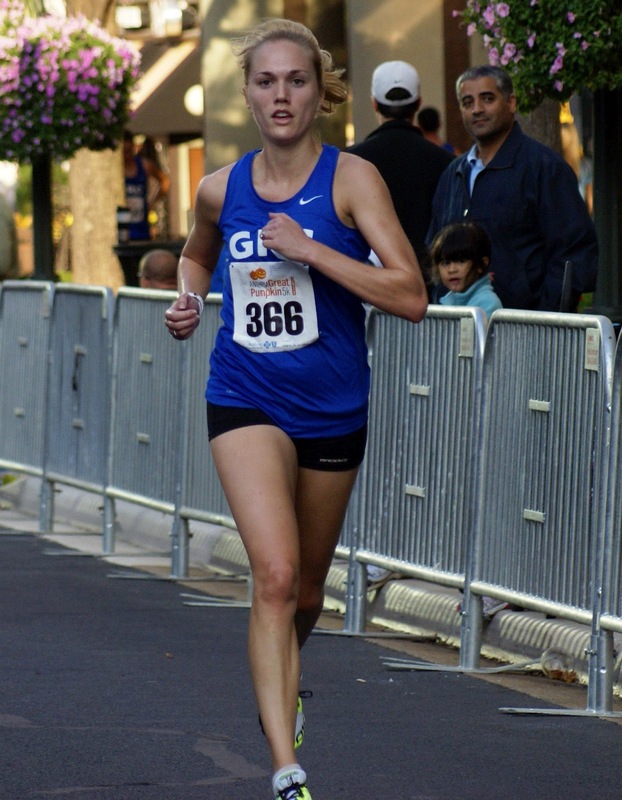 The women will be led by Lindsay O'Brien, who will be making her long awaited return to cross country. 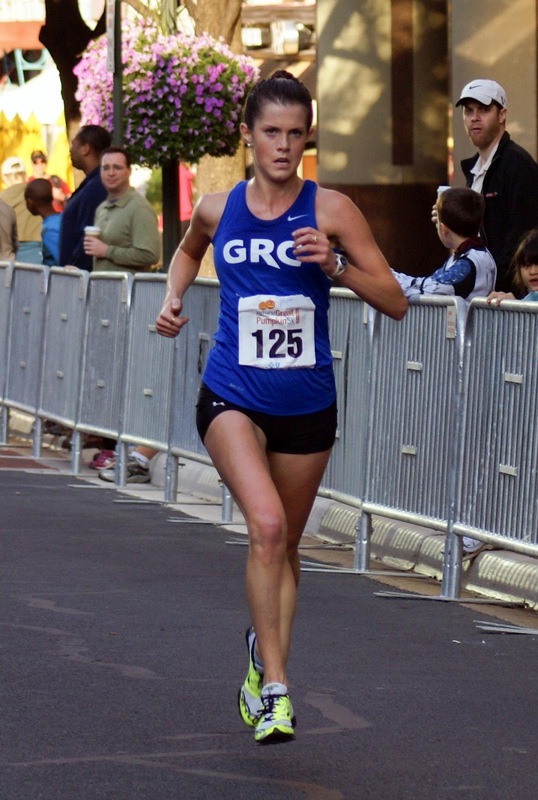 Lindsay had a truly outstanding career as a harrier at Yale, where she was a three time cross country All-American (as well as a three All-American in track). In Lindsay's junior year, she placed third at the NCAA cross country championship. While Lindsay has not run a cross country race in almost five years, she is poised to make a strong showing on Saturday. "Lindsay is rapidly returning to form," said GRC coach Jerry Alexander. "As well as she's been training, I would not be surprised to see her begin to approach her collegiate times by the end of cross country season." Lindsay will have ample support from fellow collegiate standouts Laura O'Hara, who ran in two NCAA cross country championships during her stellar career at Stanford, Catherine Campbell, a four-time NCAA D-III qualifier at Dickinson, and former Heps scorers Maura Carroll (Cornell), Susan Hendrick (Columbia), and Hilary May (Harvard). Leading the men's squad will be Ryan Witters, fresh off a personal best in the 8k. "Witty" ran a track season any post-collegiate runner would be happy with and, after a light summer, is ready to continue his fine racing streak. Coach Alexander noted: "Witty looks great right now, and because the race is only 5k, he will be able to make his seasonal cross country debut at a distance that he is comfortable with." Joining Witters will be "Texas" Paul Guevara, Dickson Mercer, Jason Myers and Patrick Murphy, whose been laying low this past summer and fall due to a rigorous school and work schedule. "Paul has been training very well, and he is ready to stake his claim to a top 5 position on our team at Clubs," said Alexander. This race also marks the long-awaited return of Dave O'Hara. "Dave O has been extremely impressive in workouts, and I'm excited to have him back in the GRC fold." We had several strong performances this weekend, at the Wilson Bridge half marathon, and several other races in various locales, but the clear highlight of the weekend was the guide duty performed at the National Industries for the Blind Visually Impaired National Half Marathon Championship by six of our runners, Dickson, Andy, Scott, Chuck, Kirby, and Christina. Not only was this a great way for the team to perform a service for the running community, it was a wonderful experience for each of our guides. Our athletes who raced Wilson Bridge also distinguished themselves, led by Michelle, who was fifth in 1:19:57. Michelle was bothered by a very tight calf, but she hung tough and ran a strong final 5k, despite knowing that she would not meet her goal for the day. It's that kind of toughness that will propel Michelle to a major breakthrough in the shorter distances later this season, and on to a huge 2013. Outlaw continued his comeback from injury with a solid 1:12:02. In other races, Charlie easily won a 15k in Virginia, Jake easily won a 5 miler in New Hampshire, and Jason ran 15:48 for 5k in Virginia Beach. Locally, Alex, Catherine, and Susan ran well in a hillier-than-expected 5k. Well done to all! 1) Those of you who told me you plan to run the Bull Run xc meet on Saturday must register with the comp code by TOMORROW. If you want to run, but did not receive the message regarding the registration code, give me a shout right away. 2) Because of the xc race, there is no practice Saturday. If you aren't racing, and want to do a workout Sunday, let me know. 3) If you can't make it to the workout on the mall Wednesday (more on that below), you are welcome at the NOVA practice on Tuesday, which will be at TC Williams, at 6:15. We will be on the mall, for a 7:15 start. 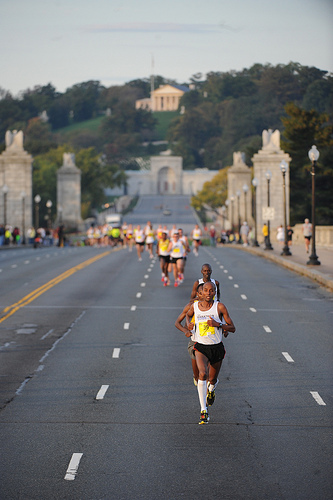 The loop is adjacent to the Smithsonian metro stop, and an easy jog from metro center. We'll meet at the southeast corner of the loop (see map below) for the warmup at 6:30. I will be there to stand sentry over your stuff. The loop is darn close to 800 meters. Wear GRC warm up gear, so we can let the locals know who we are. For those of you who are driving, LTO, our mall sherpa, reports that you can park in parking lot north of the Capitol Reflecting Pond, which is about a one mile jog from the loop. It's essentially the far end of PA Ave., closest to the Capitol. See you at 6:30 on the mall on Wednesday. While most of you were sleeping, Jake "Red Fox" Klim was headed to New Hampshire where he ran away with a victory over a mountainous 5.1 mile course, coming home in 4:48 and winning by over three minutes. As you all know by now, becuase the MCRRC x-c race was postponed to October 28, we'll have practice on Saturday at the cell tower field. We'll start at 9, so plan to meet for the warm up at 8:15. 1) If you plan to run the Bull Run xc meet on October 13, please email me right away. We have the possibility of comps, so I need as precise a head count as possible. The race info is here. http://www.prraces.com/glorydays/ If you are going to need a ride, also let me know that. 2) If you can't make the Bull Run meet and want to race this weekend, let me know, as we'll have a contingent at a local 5k. 3) I'm hoping the weather will permit us to do the workout this Wednesday, Oct 10, on the Mall. I'll have a better idea of the forecast by Monday, and we'll firm up our plans. BCC is not available, and if the Mall is out due to the threat of rain, we'll have to get creative. One way or the other, though, we'll figure it out. 4) If the plan for Wednesday is not feasible for you, you are always welcome at the NOVA practice on Tuesday. We had a strong GRC presence this past week, and I think everyone agreed it was time well spent. 5) For those of you who are serving as guides for the visually impaired at Wilson Bridge on Sunday, you should be all set with logistics. If you haven't heard back from the race folks, let me know right away. As for the workout on Saturday, the men will do 3 x 9 minutes on, 4 minutes off. After number 3, you'll take a 6 minute rest, and then do 5 x 45 second strides, with 1:30 rest. The women will do 3 x 7 minutes on, 3:30 off. After number 3, you'll take a 5 minute rest, and then do 5 x 30 second strides, with 1:30 rest. If you can't make it Saturday, there will be an option to do some work Sunday at BCC, so give me a shout for the scoop on that. Good luck to those of you who are racing this weekend. Send 'em! 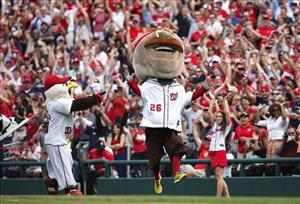 After over 500 consecutive losses,Washington Nationals mascot Teddy Roosevelt, seen here breaking the tape, outsprinted rivals Lincoln, Washington, and Jefferson to win his first race at Nationals Park. "Teddy had some excellent workouts on the track this summer," said Coach Jerry Alexander. 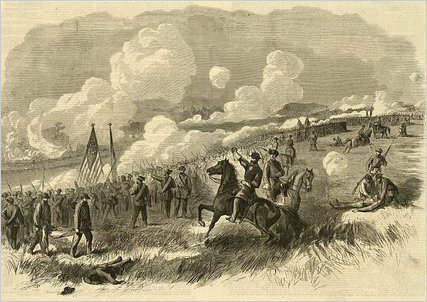 "And his race today was tactically brilliant: Teddy exploited the gap created when the Philly mascot stormed onto the course to bludgeon the other competitors. Teddy's breakthrough performance was long overdue and richly deserved." 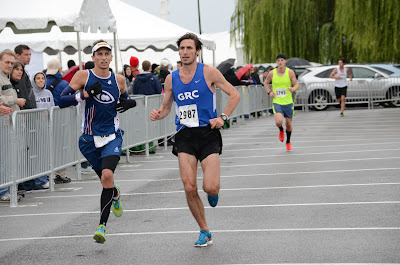 According to the Washington Running Report, Roosevelt plans to continue racing into late October to stay fit for Club Cross Country Nationals, which will be held this December in Lexington, Kentucky. We had some major PRs this weekend at 10k from Charlie, Maura, and Lauren. Charlie’s 31:43 and Maura’s 36:15, both at the Great Race in Pittsburgh, were 44 second and 50 second PRs, respectively. While Charlie’s race was a huge breakthrough, it’s fair to say that he’s just getting started, as his training was modest throughout the summer, and has only kicked into gear in the last month. Maura’s huge PR is indicative of the strength training she did over the summer, and bodes extremely well for the rest of the fall, when her focus will be on the shorter races that are her speciaility. 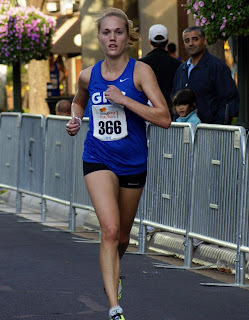 Lauren ran 37:16 on a hilly course in Reston, for a 12 second PR, and an easy victory in the Perfect 10 10k. Lauren will continue to rewrite her PRs later this fall, after she returns from her wedding. 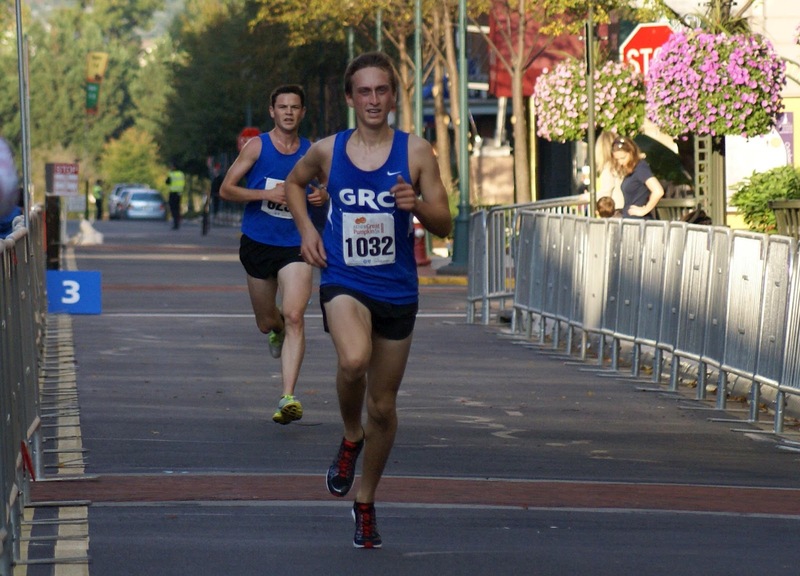 The lone exception to our parade of PRs on Sunday was Sam’s 30:59, which placed him second at the Great Race. I know you’re all tired of Sam underachieving compared to his more accomplished teammates, and I can assure that I’m only going to give that guy one more chance to get his act together. Well done to all! 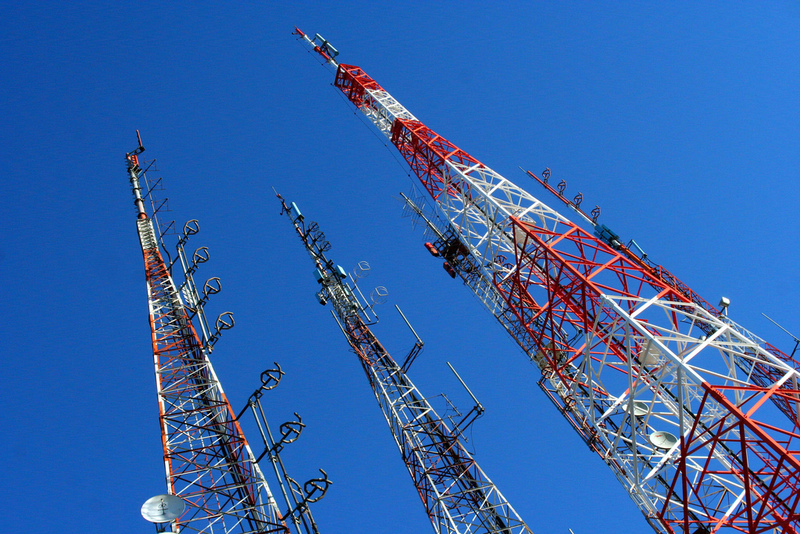 2) Because of the change in race plans, we will have a workout on Saturday October 6 at the cell tower field. I will send out further information later in the week. 3) The workout this Wednesday will be at American. We must start no later than 6:30 due to limited light. If you’re driving, plan to meet at the track at 5:45 for the warmup. If you’re taking the metro, be sure to arrive at Charlie/Sam/Witty’s house no later than 5:40 for the run over to the track. 4) A few of you have indicated that you want to work out tomorrow in conjunction with the NOVA practice. Please be ready to roll at 6:30 at WAKEFIELD HIGH, as light is an issue on that track as well. 5) Because we’ll be racing on October 13, the plan to move practice next week to Thursday to allow us to use BCC is not going to work. My current thinking is that, weather permitting, we will hit the mall. If, however, the forecast is not favorable, we will have to reconsider that plan, so stay tuned for updates on next week’s practice. There will be two options for the men. The distance oriented workout will be 4 x mile w/ a 2:00 rest. The cross country oriented will be 3 x 1200, 4 x 400, with a 3:00 rest after the 12s and 2:00 after the 4s. If you have questions about any of this, give me a shout. I’ll see you at AU on Wednesday for a 6:30 start.